Jamshedpur: The Centre for Global Management and Responsible Leadership at XLRI- Xavier School of Management, Jamshedpur in collaboration with Manipur Institute of Management Studies, Manipur University successfully conducted a two day National Conference on “Promoting Business Opportunities in North Eastern India and India’s Act East Policy” on November 15th and 16th, 2017 and a one day Pre Conference Case Teaching and Writing Workshop on Nov 14, 2017 at the Manipur Institute of Management, Manipur University, Imphal. 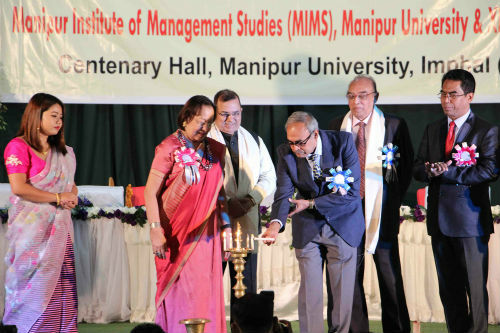 The conference was inaugurated by Dr. Najma Heptulla, Governor of Manipur who was present as the Chief Guest. The session was also attended by Prof. Adya Prasad Pandey (Vice-Chancellor, Manipur University), Prof. N Lokendra Singh (Dean, School of Social Sciences, Manipur University), Mr. Nakib Ahmed (Advisor, NE Initiative, Indian Chamber of Commerce, Kolkata) and several delegates, entrepreneurs of the State and students. Delivering the inaugural address, she said that the land of Manipur is very fertile not only for biodiversity but also for future development of the youth which is why she is totally involving with the young children and youth of the State and that the Prime Minister is concerned about the issue of backwardness in the NE region. She expressed her belief that policy makers, researchers and practitioners from different parts of the country participating in the conference would explore ways and means to promote business opportunities in the NE States. Dr. Heptulla termed the conference as a platform for policy makers, researchers and practitioners to present their understanding on how business opportunities can be promoted in the NE region. The Governor also said that she would like to look up the recommendations of the conference which could be beneficial for the development of the State. Prof. Adya Prasad Pandey, Vice Chancellor of Manipur University and the President for the inaugural function thanked XLRI was taking up the initiative in his address. In the keynote was delivered by Mr. Nakib Ahmed, Advisor, NE initiative, Indian Chamber of Commerce, Kolkata, he highlighted the initiatives taken up for the development in this region specifically with Manipur becoming the Gateway to other South East Asian countries. The Conference was co-chaired by Prof. Ibohal Meitei (Director, Centre for Entrepreneurship and Skill Development, Manipur University) and Prof. Pingali Venugopal (Chairperson, Centre for Global Management & Responsible Leadership, XLRI, Jamshedpur). “Through this conference, we aimed to draw out strategies for ‘Promoting Business Opportunities for the North-East India’. We had invited practitioners and experts to present papers on how business opportunities could be promoted in the region. In all we had 32 research papers covering various issues of North East. We had participants from various parts of the country, including Utarakhand, Gujarat and Maharashtra and Thailand,” said Dr. Pingali Venugopal, Coordinator, Centre for Global Management and Responsible Leadership at XLRI. “Dr. Najma Heptulla was very happy that XLRI has taken this initiative and she stated that Act East Policy is opening up many opportunities for North East. She wanted XLRI to continue their involvement in the development of North East. We look forward to hold a follow up conference next year,” Dr. Venugopal further added. At the conference, 4 panel discussion sessions were held with Industry, Academicians, Government and Chamber of Commerce members. The technical sessions and panel discussions focused primarily on Business Practices in North East India and Developing North East as a vibrant region for Trade, Commerce and Industry in the light of India’s Act East Policy. The researchers and practitioners emphasized the need for develop entrepreneurs to tap the vast potential of this region. A Pre-Conference Case Workshop was organized on November 14th, 2017 with the purpose of introducing case teaching methods and the importance of writing business cases for teaching purposes to faculty and doctoral students of North-East and also to guide in drawing out action plan for the region.